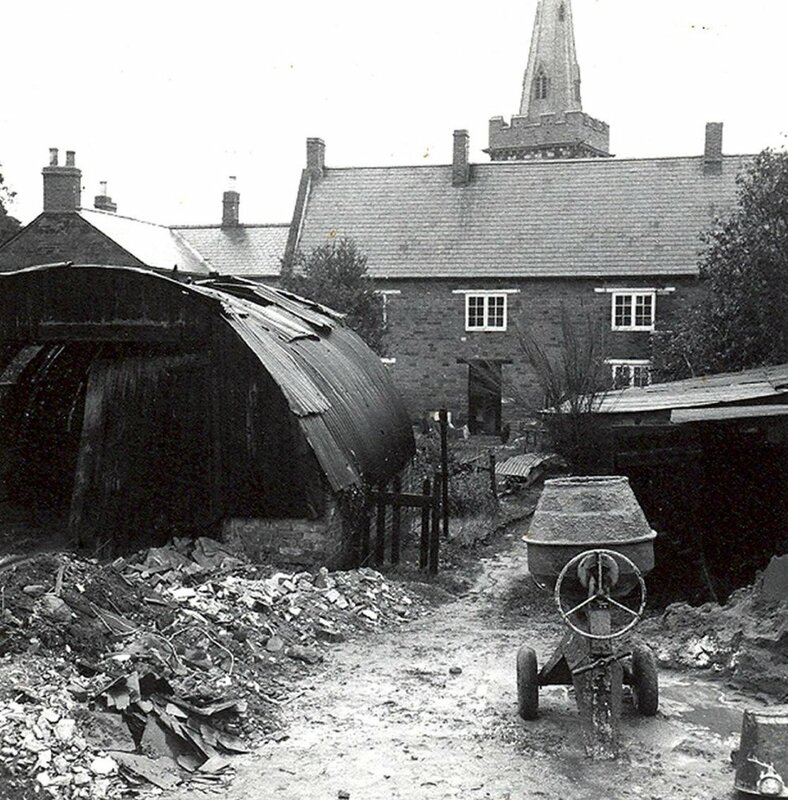 Back of The Manor, 6 Church Road, showing a Nissan hut in the garden. Next door to The Chequers in Manor Road is another house named Manor House. It was at some time called Kites Hall until it was occupied in the 1890s or in 1900 by the Rev. Humphrey G Roberts, the curate of Spratton and later the vicar. It appears from Northampton Mercury of 17 August 1900, that he bought it at that time, possibly from Thomas Gulliver , believed to have bought it in 1892 (but if Gulliver did, he had died by May 1894 as his estate was being advertised by his executors). (Roberts may have occupied as tenant of the executors?). Roberts changed the name from Kites Hall to the Manor House. The vicar seems to have been fond of changing names as he changed his own name to Humphrey G Roberts Hay-Boyd when he married Mary Hay-Boyd. He remained in Spratton for 11 years donating a stained glass window to the church in 1906. 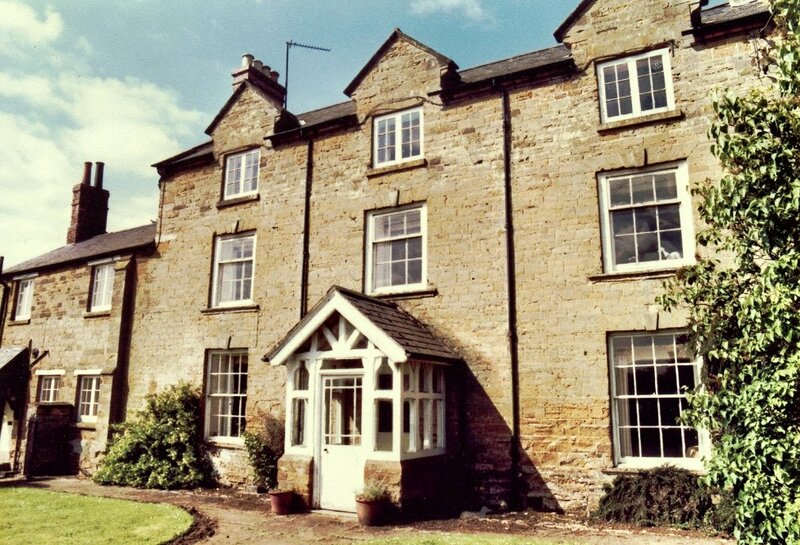 In the 19th century the house was owned by the Lantsbery family, people of considerable substance locally owning farms in Ravensthorpe and Creaton as well as property in Spratton. William Lantsbery, 1751 - 1821, and his wife Alice, 1761 - 1831, were members of the Creaton Independent Chapel and their first four children were baptised there between 1799 and 1805. 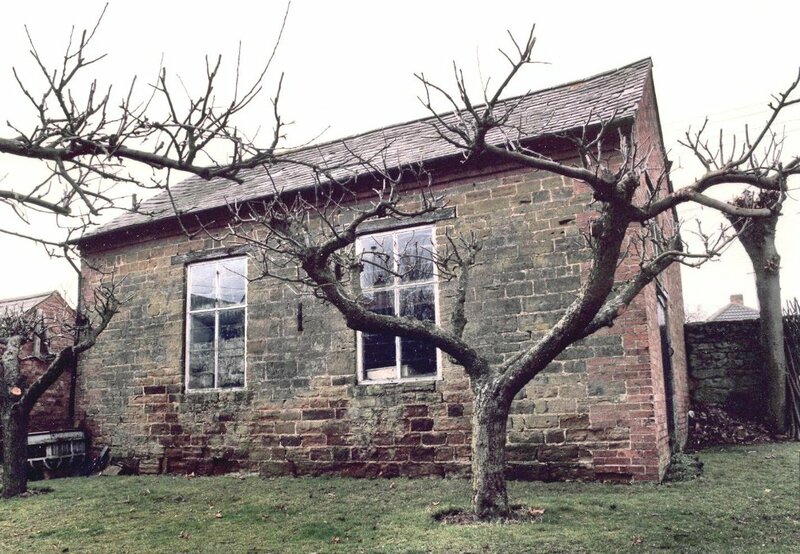 The building on High Street, which is in the grounds of Manor House, was built in 1806 as a chapel for the United Reformed Church for the freedom of worship for Protestant dissenters. William Lantsbery, then owner of this Manor House, gave the land and some stone to supplement the money raised by the Creaton Chapel members. "Began to build this meeting in our orchard June 27th 1806 and it was built by subscription and collected by Mr. Whitehead. My dear Mr William Lantsbery gave the ground and stone to build the East side and boarded the men whilst in building it. Opened it the day I was 30 years old September 27th 1806"
"We the undersigned being Protestant Dissenters from the Church of England do hereby certify that a certain building, newly erected in a piece of ground belonging to Mr Wm Lantsbery, situate in the Parish of Spratton, and County of Northampton, is intended for a place of Worship, for Protestant Dissenters to meet in, according to the Statute of King William and Queen Mary, commonly called the Toleration Act - Witness our Hands this 4th day of October 1806". William and Alice's son, William 1802 - 1884, a prosperous farmer lived at the family home and married three times. He took a lively part in village politics and showed great concern for the plight of the poor. As a dying man he was admitted to membership of the Independent Church on 2nd January 1884. He died on 18th January. Two William Lantsberys had lived in this house for many years and the road adjoining the property to the rear became known, rather disrespectfully for the times, as Billy Lantsbery's backside. The Manor, Church Road. 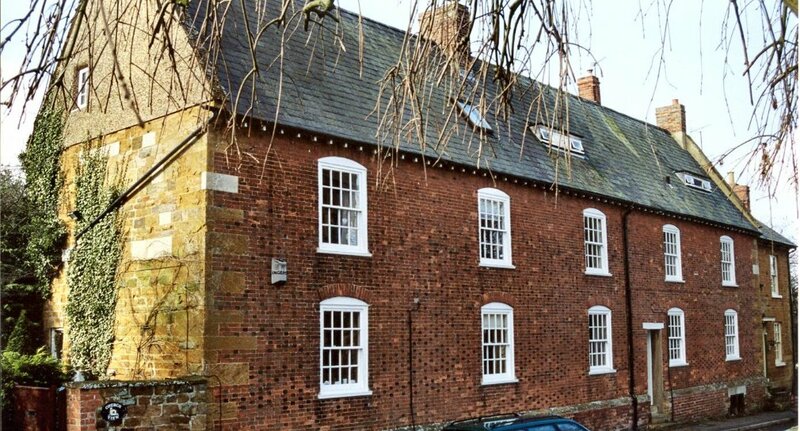 It is said to date back to 1619, but this may apply to some internal features only as the house is probably early 1700s, later reclad, probably 1820/30s. Known that it was thatch until 1905. Existence of dovecote suggests Manorial quality. Francis Beynon (married to Elizabeth Dorothy, nee Okell, daughter of Royle Bateman, vicar of Spratton from 1684 - 1733) was known to have acquired an estate of just under 300 acres at the time of the Inclosure Award of 1766. This passed on his death in 1778 to his only surviving child, Elizabeth (married to Andrew Hackett and of Moxhull in Warwickshire), who erected a memorial in the church. On her death, it passed to her son Francis Beynon Hackett, who never lived in Spratton, but resided at Moor Hall, Sutton Coldfield, Warwickshire. 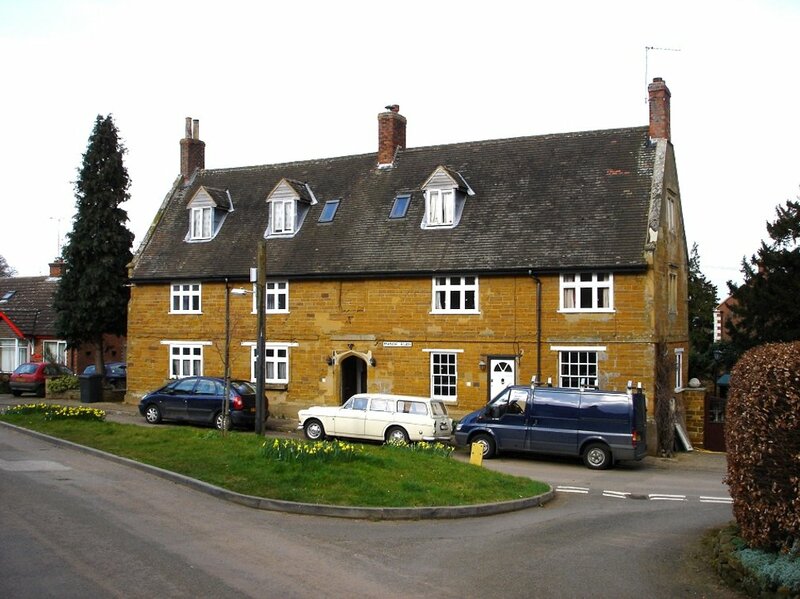 It is known that the estate included the White Horse Coaching Inn (in what is now Brixworth Road), and also the Manor House in Church Road and adjacent 3 acre site (then known as Greens Close, upon which St. Luke's Close development was made in the 1960s). The Estate was put up for sale in 1826. When nothing sold, it was put up for sale again in1838, when the Manor and adjacent Close were bought by Edward Butlin from Hackett's heirs. In 1871, Rev Llewellyn Roberts was considering buying the house (there is a draft contract in the Record Office), but this never proceeded. At that time the close was farmed (together with the easterly 27 acres of the Broomhill site) by John Rixon, who lived in the Manor house. Later, Edward Copson bought the house in 1874 and the Close in 1880. 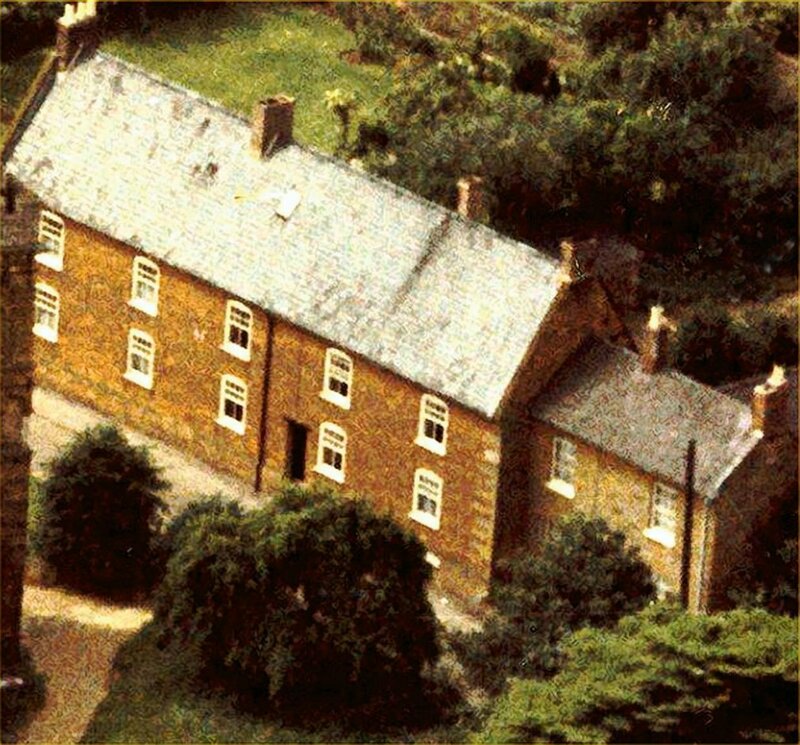 At that time it was a single long dwelling (now 2 houses, numbers 6 & 8) with the entrance at the back. Shortly afterwards it became the Post Office, requiring the construction of the Church Road entrance and steps so as to facilitate the handling of mail bags. Mr Copson divided the house into its present two dwellings at around the turn of the century. The thatch was destroyed by a terrific storm in 1905, and the house was then slated. The house passed to Ernest Copson, and when he went to the War in 1916, the Post Office was transferred elsewhere. Ernest Copson's widow remained in residence after his death. In 1926, when they moved to Spratton, the Saul family became her tenant. The house was then known as Church View and included the now separate house of that name. Later it became The Manor. The property owned the land that became St. Luke's Close - this was sold early in the 1960's. Tony Griggs lived here from 1967 -when he moved in there was an outside loo only and no bathroom - until 2007. Francis Beynon (married to Elizabeth Dorothy, nee Okell, daughter of Royle Bateman, vicar of Spratton from 1684 - 1733) was known to have acquired an estate of just under 300 acres at the time of the Inclosure Award of 1766. This passed on his death in 1778 to his only surviving child, Elizabeth (married to Andrew Hackett and of Moxhull in Warwickshire), who erected a memorial in the church. On her death, it passed to her son Francis Beynon Hackett, who never lived in Spratton, but resided at Moor Hall, Sutton Coldfield, Warwickshire. 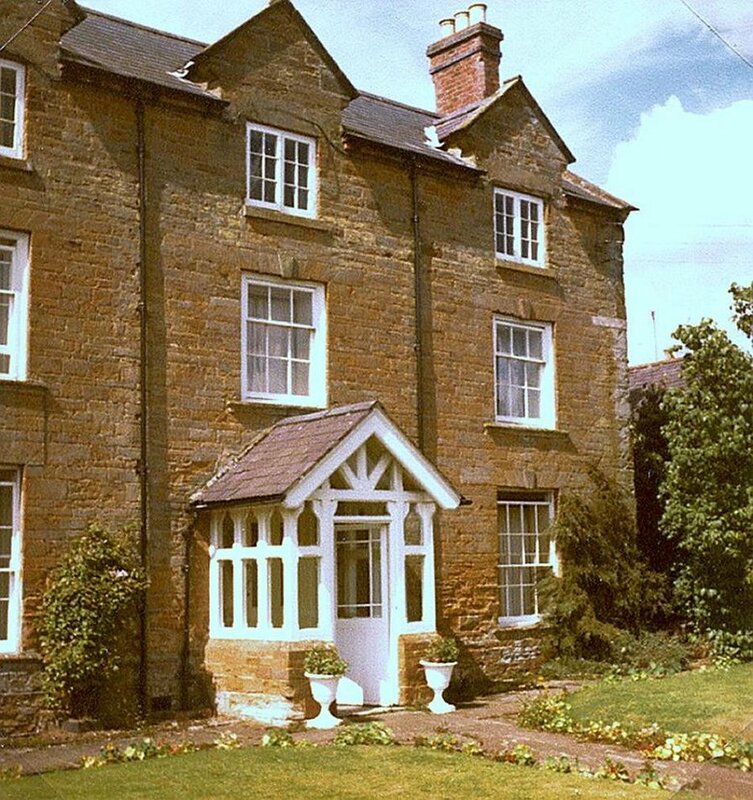 It is known that the estate included the White Horse Coaching Inn (in what is now Brixworth Road), and also the Manor House in Church Road and adjacent 3 acre site (then known as Greens Close, upon which St. Luke's Close development was made in the 1960s). The Estate was put up for sale in 1826. When nothing sold, it was put up for sale again in1838, when the Manor and adjacent Close were bought by Edward Butlin from Hackett's heirs.Butlin sold the house and the close to Rev Llewellyn Roberts in 1871. At that time the close was farmed (together with the easterly 27 acres of the Broomhill site) by John Rixon, who lived in the Manor house. Later, Edward Copson bought the house in 1874 and the Close in 1880. At that time it was a single long dwelling (now 2 houses, numbers 6 & 8) with the entrance at the back. Shortly afterwards it became the Post Office, requiring the construction of the Church Road entrance and steps so as to facilitate the handling of mail bags. Mr Copson divided the house into its present two dwellings at around the turn of the century. The thatch was destroyed by a terrific storm in 1905, and the house was then slated. The house passed to Ernest Copson, and when he went to the War in 1916, the Post Office was transferred elsewhere. Ernest Copson's widow remained in residence after his death. In 1926, when they moved to Spratton, the Saul family became her tenant. The property owned the land that became St. Luke's Close - this was sold early in the 1960's. 14 Manor Road and 16 Manor Road, previously part of Erskine's holdings. Stone building from the late 1600s, but the left doorway (No. 14 Manor Road) is 1500s or early 1600s, perhaps not in its original position. The building is considered to be of manorial quality. Stone building, of same age as Northbank House, when it would have been a 2-storey house. Raised later (perhaps c. 1800) when it was known as Kites Hall and when a Chapel of the United Reform church, was built in the top of the garden in 1806. Owned by William Lantsbery, probably from the 1840s until his death in 1884. Then appears to have been vacant as refurbishment was carried out by the Cheneys in 1888 (image 1786). In 1891, the house was lived in by a butler (surname indistinct, but 'Mercury' article of 11 September 1891 records it in the occupation of Brooks, Henson and Taylor), and it appears that it was then bought by Thomas. Gulliver in 1892 (papers from Mrs Shirley, and see notes 0680). (He bought with 3 acres of land, which is the acreage that went with the other Manor in Church Road, but this was occupied by Copsons in 1891 and 1901, so perhaps just a coincidence). Gulliver had moved from the farm at Holdenby Lodge when he retired from farming and passed the house and farm over by one of his sons George, and had bought this in 1892. Presumably extensive alterations had been carried out prior to this, the 1888 window reference (image 1786) show these works. 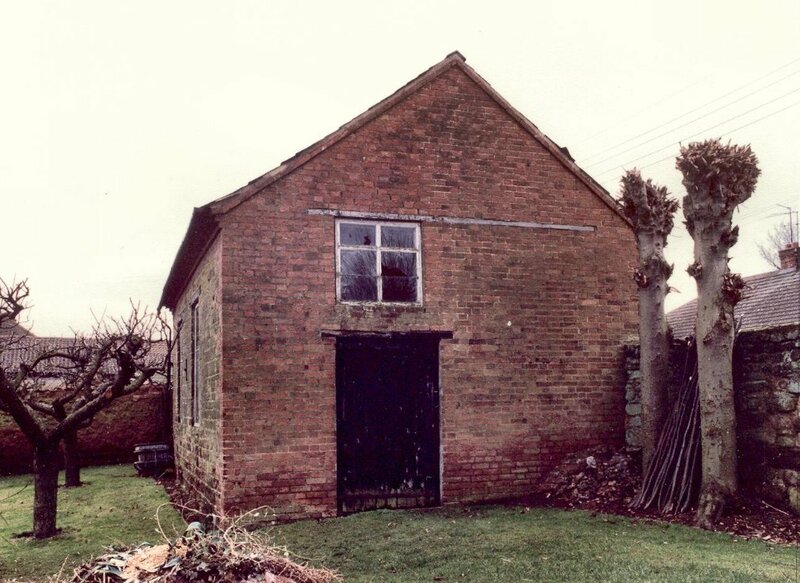 Daughter, Ellen Gulliver, was married In Spratton Church in 1893 to Mr. C. Barrett of Mixbury Lodge. Canon Roberts officiated and the curate, Rev J. Chubb, played the organ. It appears from Northampton Mercury of 17 August 1900, that Rev Humphrey Roberts Hay Boyd bought it at that time (it also came with 3 acres of land), possibly from Thomas Gulliver. He lived here briefly (1901 census). In 1911, it was occupied by caretakers.